You must purchase a license for each domain that you want to use this plugin for. You are required to watch and monitor the entire installation and configuration procedure. 6. Register your plugin in the License Manager configuration screen. First check if you have installed the actOpus License Manager. You should see that plugin in group 'misc' of your plugins. If you don't see the actOpus License Manager then follow the procedure 'How to install the actOpus License Manager' to install the license plugin. Locate the root folder of your webshop. This folder should contain other folders like 'Administration, bin, Content, Plugins, Themes' and more. Unzip the contents of the downloaded file into this 'Plugins' folder. 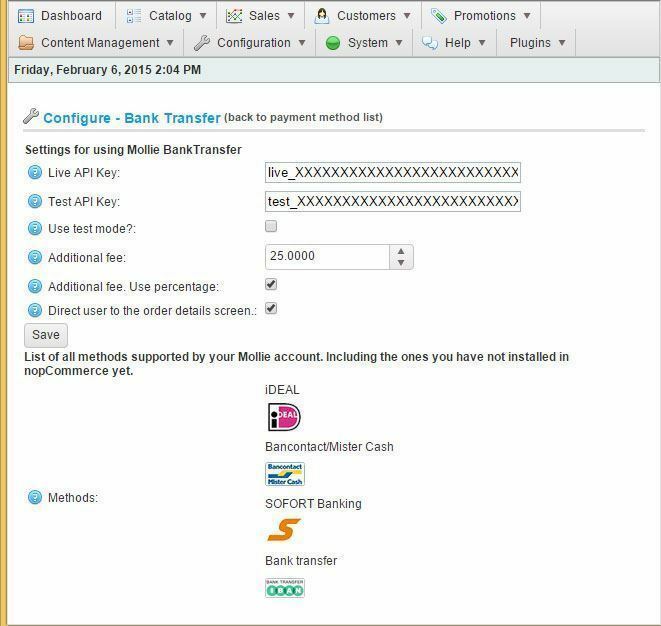 The zip file already contains a folder for the plugin 'Payments.Mollie.CreditCard' so when you unzip make sure you select the 'use folder names' option. 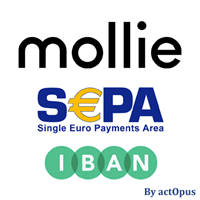 Now your 'Plugins' folder should contain a folder named 'Payments.Mollie.CreditCard'. Latter should contain a dozen files. Leave the Live webhook or Test webhook in your Mollie dashboard empty. These webhooks are generated by the Mollie Plugin! Go to your nopCommerce administration environment. From the top menu 'Configuration', select the sub menu 'Plugins'. Click the button 'Reload list of plugins', usually located just below the right top of the screen. Back in the list: Click on the button 'Configure', it's just below the plugin. Click on the button 'Configure', it's just below the plugin. Check 'Use test mode' if you want to test your payments. Uncheck this option for Live payments! Set ' Additional fee ' to 0.0 if you don't want to charge your customers for this payment method. When ' Additional fee' is set to a value <> 0.0 then check 'Additional fee. Use percentage' if you want to charge your customer based on a percentage of the order value. In that case the value for 'Additional fee' is interpreted as a percentage in stead of fixed fee. if not, check your merchant info and try again. Otherwise, buy support from actOpus. 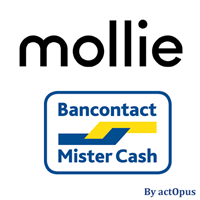 Learn more about Mollie tarifs here. Unzip the contents of the downloaded file into this 'Plugins' folder. The zip file already contains a folder for the plugin 'Actopus.LicenseManager' so when you unzip make sure you select the 'use folder names' option. Click the button 'Configure' (or 'Instellingen'), it's just below the plugin. Click the button 'Add another license', it's just below the wrench icon. In 'the license key' field, paste your license key that has been sent to you by email. Next click the 'Update' button at the end of the row. 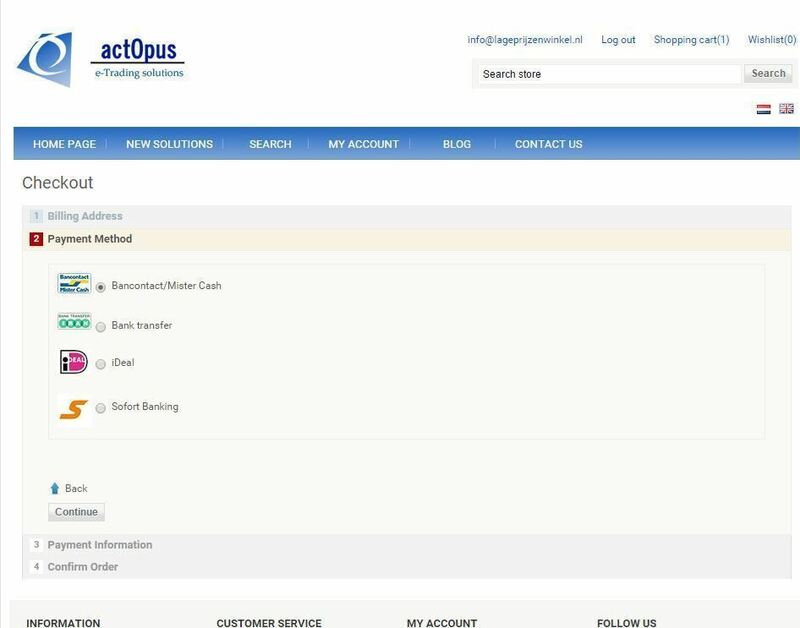 The license manager will now contact the actOpus server and retrieve the information about your license. Make sure the Domain/Url column matches your webshop's domain. Contact us if it doesn't match. Remember that your license is linked to the said domain/url and will only work for that domain. Repeat steps 6, 7 and 8 for subsequent licenses. Continue with the installation of you other plugin. What information is sent to Mollie? 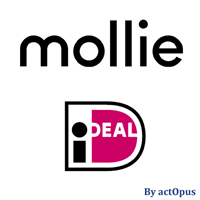 What information is retrieved from Mollie? -The payment outcome: Canceled, Paid. What happens when a customer wants their NopCommerce account to be deleted?